2015 release. In under a year as a band, Alias Kid have risen from obscurity to headline shows in Manchester and Liverpool, secured national airplay on XFM and have won plaudits from those within the music industry. 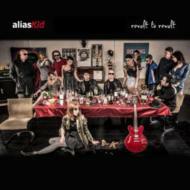 Alias Kid have recently joined the roster of the iconic Creation Management, home to The Jesus and Mary Chain and Wilko Johnson. Revolt To Revolt boasts the singles Dirty Soul, Zara Henna and Messiah.